For some more details on Kona Pro Qualifying, check out my post explaining the elements of the system. By now Ironman has also released the races that will have “floating” slots (other than the Regional Championships in Mar del Plata, South Africa, Texas, Cairns and Frankfurt), see the section on “Upcoming Qualifying Races”. Second and third place finisher in Kona receive a slot for next year’s Kona race. This slot has to be verified by finishing at least one Ironman outside of Kona. 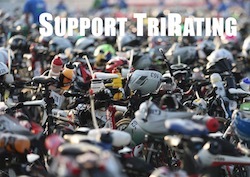 If an athlete has not validated his/her Kona Podium slot, “(NV)” is added. The winners of the 70.3 Championships receive a slot for next year’s Kona race. This slot has to be verified by finishing at least one Ironman outside of Kona. If an athlete has not validated his/her 70.3 slot, “(NV)” is added. This is the “normal” way of qualifying by winning or finishing close to the front in an Ironman race. There is no additional validation requirement for this type of slot. Athletes who declined a slot they earned in one of the qualifying races. It’s unlikely but if they get another in another race, they may still accept that “second” slot. The unassigned slots are proportionally assigned to the male and female Pros according to the number of Pro starters in the race.